Vacuum packed sachet with 80 grams of a spectacular Paleta Ibérica de cebo (ham shoulder) sliced by machine. This slicing is presented in a practical vacuum-packed sachet, filled with a product that has been pampered to its optimum point of consumption. La Paleta Ibérica de Cebo is a delight that will leave no one indifferent, an intense Iberian product with an excellent value for money. The Iberian pigs have an advantage over the rest of the animals, they are the only ones on the planet capable of infiltrating fat into the muscle, which gives rise to these small white marks inside each slice. The first hundred kilograms of weight of any Iberian pig are obtained in the same way, feeding the animal first with the mother's breast and then with feed full of vitamins and minerals. This diet is essential for the animal to be strong, muscular and have strong bones in its final fattening phase. 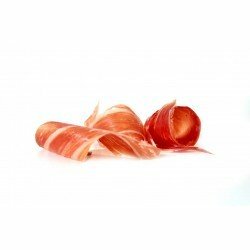 The meat of this type of ham shoulder is appetizing, juicy and full of nuances and its flavor is perfect for the finest palates that enjoy every nuance. 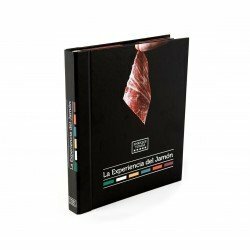 The taste of the ham shoulder is more intense than that of the jamón and from the first bite you will notice all its nuances in the mouth.